Nordkapp (North Cape) is a 307 m (1007 ft) high cliff rising above the Arctic Ocean, located in Finnmark county in Norway. It is the northernmost point in Europe reachable by car, and the northernmost place connected with the international road network. Some 200,000 tourists visit annually, during the two to three months of summer. The town Honningsvåg is 34 km south of Nordkapp, 30 minutes' drive by car. Nordkapp and the road leading to it are closed in winter. Nordkapp is promoted as the northernmost point of mainland Europe, which is not true. Nordkapp is on an island (Magerøya) and the neighbouring point Knivskjellodden is actually 1,457 m (4780 ft) further north. Nordkapp is however the northernmost point in Europe reachable by the international road network. Islands farther north, such as Novaya Zemlya, are far from the mainland. The midnight sun may be enjoyed 14 May–29 July, unless the night is cloudy. In 1553 an English commander, Richard Chancellor passed Nordkapp and named the cliff as Nordkapp, the North Cape. From that time, it has been called Nordkapp. At that time it wasn't exactly the centre of interest. But only 100 years later, the first "tourist" was reported to have climbed up to the plateau. He was an Italian priest named Francesco Negri. It took him more than two years to go from Italy on foot, by boat, on horseback, on sleighs and on skis. 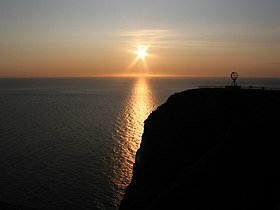 In 1664, finally having reached his destination, he noted in his travel log: "Here I am now on the North cape, at the extreme tip of Finnmark, really at the end of the world"
In the 18th and 19th centuries, a journey to Nordkapp was still an adventure – and an expensive one at that. One needed to get a ship with crew or to arrange an expedition through hundreds of kilometres of wilderness. This is why there were quite a few high-ranking people among the first tourists: Prince Louise Phillippe of Orleans, Oscar the second, King of Norway and Sweden, King Chualalonkorn of Thailand. He got his name and date carved into a rock on the top of the plateau. This rock can be seen in the Panorama hall in front of the souvenir shop. And Kaiser Wilhelm II of Germany was here also. In 1875, London Travel agent Thomas Cook organized the first group travel to Nordkapp for 24 participants. At that time travelling to Nordkapp was very different compared to how it is now. There was no road leading across the island to the plateau. Travellers were taken by rowing boat from Skarsvåg or Gjesvær to Hornvika, just below the north cape. From there they had to climb up the steep and rocky ravine, to reach heigh of plateau. The first modest wooden buildings started to appear on the plateau. One of those was the hut "Stoppenbrink's Champagne Pavilion. 71.00972225.9836111 Honningsvåg Airport, Valan (HVG IATA). has three daily departures from Tromsø and Hammerfest. 70.06666666666724.9738888888892 North Cape Airport (LKL IATA). in Lakselv (some 175 km away) has five daily departures from Tromsø, and Lakselv has two daily bus departures to Honningsvåg. This airport is classified as an international airport, and handles most of the travellers to Nordkapp arriving by plane. All regional flights are operated by Widerøe. International charter routes are operated by Condor, Spanair and SAS. Nordkapp is where European route E69 ends. E69 branches off European route E6 at Olderfjord, 129 km (80 mi) away. The road passes several tunnels and the deep undersea North Cape Tunnel (reaches 212 m below sea level at it's lowest point). There used to be a toll, but since 29 June 2012 using the tunnel is free. The North Cape Tunnel has a continuous downwards and upwards slope of 9%. The road inside the tunnel has one lane in each direction, with a dedicated lane on each right side for cyclists. Select the correct gear before entering the slope. This is important, since there is no clear view of when the slope goes from downwards to upwards. Consider driving a car with an engine able to increase speed considerably when driving upwards. Hurtigruten calls Honningsvåg. Several Cruise ships visit Honningsvåg and Nordkapp every year. It is possible to transport a car (not a camper car) on Hurtigruten. This is an interesting option to cut distances, for example if going to the Mehamn area, the northernmost mainland in Europe. When arriving by bicycle, be aware of the tunnel from the mainland. This is a 7 km tube going 212m under the sea level. Good fun the first 3 km, and remember the speed limit. You'll need good gears to get out again. At the road from Honningsvåg to the North Cape plateau, you will need them to. Take care of the wind: 7 or 8 Bft with gusts far stronger than that is not unusual. At the North Cape center itself, don't forget to sign the cyclists' guest book. In Honningsvåg city center and in the North Cape area itself one can get around by foot. Practically all traffic from and to the North Cape goes through Honningsvåg, 34 km or half an hour to the south by car or bus. Travelers from Northern Europe usually arrive with their own cars or camper, and many travelers from countries further away buy a package which includes the transport to and from the North Cape. If you've simply bought a flight ticket to Honningsvåg airport, or using public buses, the only way to get to the North Cape itself aside from hitchhiking or hiking (only for the most adventurous, and bring your own tent as there is no accommodation whatsoever on the cape itself) is taking a taxi, or the local bus 330 (www.177finnmark.no), which runs a few times per day in the summer and not at all in the winter. Hurtigruten charters special buses going to North Cape. Tickets are bought onboard. The ship stays several hours in Honningsvåg so there is time for such a trip. Kirkeporten (Church gate) (A short walk from E69). A cliff with a hole trough, where the view towards Nordkapp can be enjoyed. Nordkapphallen. 1 May-17 May: 11Am-3PM, 18May-31 Aug: 11AM-1AM. A big hall carved out in the plateau, where the view can be enjoyed. Adults: kr 235, students: kr 150, children: kr 80. Nordkappmuseet (In the harbour by Rica Honningsvåg Hotel), ☎ +47 78477200, e-mail: post@nordkappmuseet.no. 1 Jun-15 Aug: M-Sa: 10AM-7PM, Su: noon-7PM, 16 Aug-31 May: M-F: noon-4PM. Telling the aspects of fishieries and everyday life, in the far north. Adults: kr 50, children: kr 10. Birdsafari, Gjesvær (21 km (13 mi) from the junction at E69). See seabirds like puffins, and the birds' mountain. 71.12225.711 Knivsjellodden (Starting point: at the parking space 7 km south of Nordkapp). Hike to Knivskjellodden. The track is marked with red T's. The distance is 8 km (5 mi), and the hike takes an estimated two and a half hours, each way. Since the weather is unstable at this high latitude, you should always leave a message detailing where you were going and what time you left in your car. For safety, bring a GPS and mark a waypoint at the parking place. Nordkapp Jul og Vinterhus, Skarsvåg, ☎ +47 78-47-52-89, fax: +47 78-47-36-48, e-mail: post@julehuset.no. Christmas decoration and the Nordkapp Santa. Corner Café, ☎ +47 78476340, fax: +47 78476349, e-mail: post@corner.no. Nordkapp Vandrerhjem, Kobbhullveien 10 (32 km from Nordkapp), ☎ +47 91-82-41-56, e-mail: nordkapp@hihostels.no. Dorm: kr 330, Double: kr 760. Nordkapp Camping, Skipsfjorden (24 km from Nordkapp), ☎ +47 78-47-33-77, e-mail: post@nordkappcamping.no. Tent: kr 150, Double: kr 650, Cabin: kr 595-635, Bed linen: kr 90. Nordkapp Caravan & Camping, Skarsvåg (14 km from Nordkapp), ☎ +47 45-22-19-42, e-mail: bjp3012@gmail.com. Nordkapp Arran Hotel, Kamøyvær (27 km from Nordkapp), ☎ +47 75-40-20-85, e-mail: aina@arran.as. Rica Hotel Honningsvåg, Nordkappgata 4 (34 km from Nordkapp), ☎ +47 78-47-72-20, fax: +47 78477221, e-mail: rica.hotel.honningsvaag@rica.no. Rica Hotel Nordkapp, Skipsfjorden (26 km from Nordkapp), ☎ +47 78-47-72-60, e-mail: rica.hotel.nordkapp@rica.no. You can get out the same way you got in; by road, boat or plane. If you've arrived by car you can continue with the Hurtigruten ship if you want some break from the driving. This allows you to visit another peninsula or island without driving the long way around the fjords. This city travel guide to Nordkapp is a usable article. It has information on how to get there and on restaurants and hotels. An adventurous person could use this article, but please feel free to improve it by editing the page.